If you are developing your own software and applications or having that process outsourced, chances are good that open source code is being used. While there are significant benefits from using open source code, it's not a free lunch. 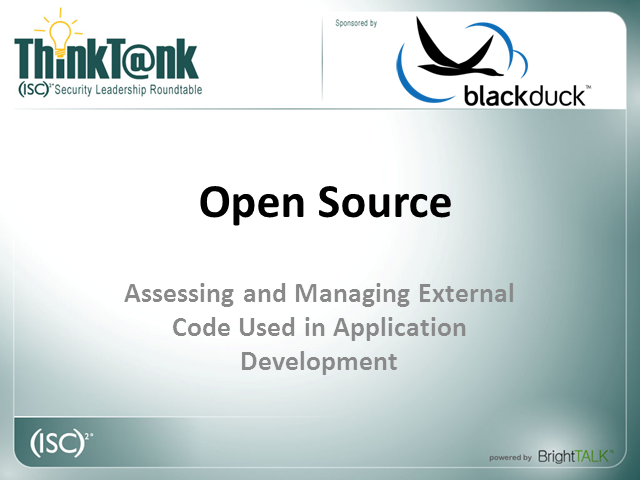 Open source software is code and code needs to be assessed and managed properly. How does a security department manage the technical and operational risks, regulatory/compliance issues and security and brand concerns the use of open source code can expose an organization to? Join (ISC)2 and Black Duck Software for our final ThinkTank Roundtable of 2011 on December 15, 2011 at 12:00 noon Eastern time as we examine these opportunities and challenges.